Machine-woven from polyester for high-traffic durability, this Lapointe area rug from Gracewood Hollow will refresh your living room. 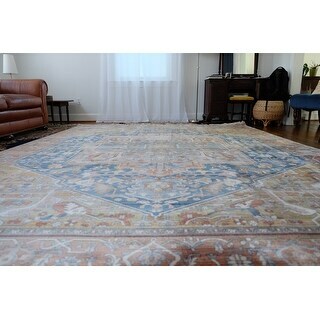 The rug features a diamond medallion pattern with a Moroccan center and floral accents. 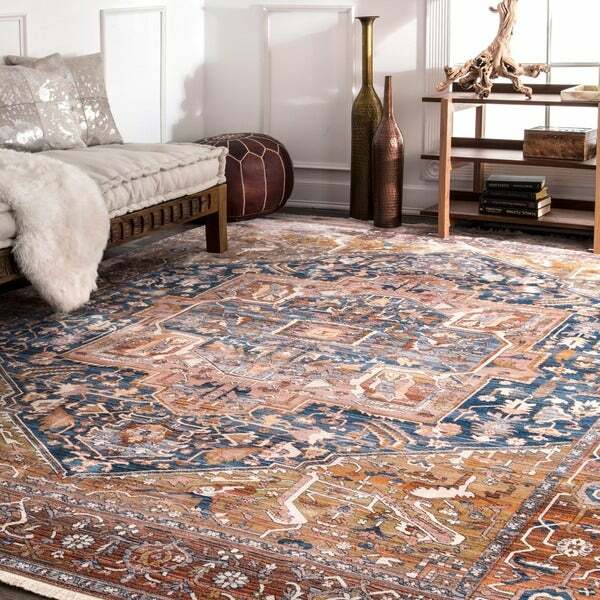 The lovely rug is rendered in charming colors, and will bring traditional style to your decor. Oh. Mah. Gah. Love! 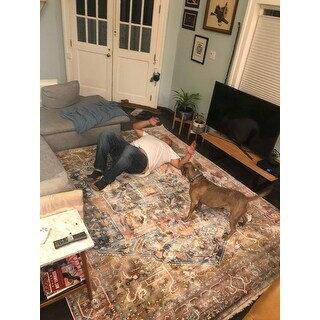 We got this rug to replace our old living room rug and could not be more thrilled. 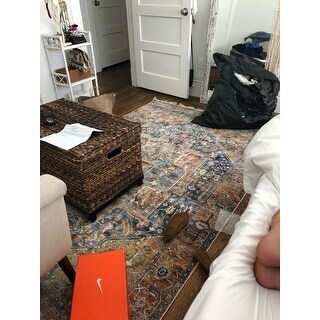 The colors are gorgeous and warm up our space, the rug itself is so soft that both dog and husband were rolling around on it immediately and it lay flat right away. It’s gorgeous gorgeous gorgeous. It lives on top of our old rug pad which might not be totally necessary but works well for us. (We have concrete floors so any extra padding is appreciated.) Quick note: when we first unrolled the rug the colors were a lot lighter than we thought and then we brushed the weave the other way and the colors popped! We love love love this rug and would buy again over and over. Great price for a great value! Option: Rust - 6' 7" x 9' 4"
I love the colors of blue, beige, and predominantly in rust. The colors add warmth and dimension to my kitchen. It is not very thick. I wish that I had bought something thicker with more high-pile. 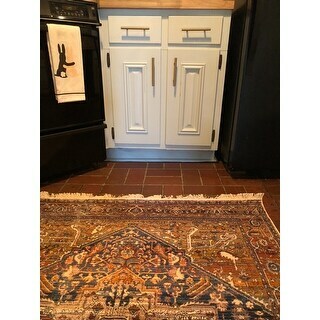 I do love the colors and the ease of cleaning if something is spilled on this rug because it is made out of durable material for the high traffic area. Great value for the price. The muted/distressed colors are as advertised. Soft weave. The motif is perfect for an Old World/ Bohemia look. I'm very pleased. This rug is STUNNING! True to color and it feels like silk. It’s very well made and the tassels on the end make it look ever more beautiful. I will 100% be buying more gracewood hollow rugs! Option: Rust - 10' x 13' | Rust - 2' 6" x 12' Runner | Rust - 5' Round | Rust - 5' x 7' 9"
I love this rug and would highly recommend it! The colors are just like the picture and it looks expensive. I would suggest a rug pad to make it more comfortable if you are using it in a living area. Colors true to photo, rug packaged well. Very pleased with quality of area rug. LOVE THIS RUG!!! The colors in this rug are beautiful!! 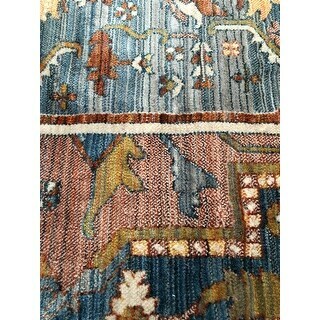 So I love this rug but gave it 4 instead of 5 stars for one distinct reason: the color changes drastically in the light. I read something about this in another review. Basically because it is made of synthetic fabric, it changes color depending on how the light hits it. So, while it looks exactly like the photo in the shade, or dark; it looks much lighter when the sun is hitting it. It almost looks pink and light blue. It is still beautiful and works well with the furniture that coordinates with a darker rust and navy, but it is something to be noted. Nonetheless, I am incredibly happy with the purchase and it looks great in my living room! And at under $300 it is a steal! This is a beautiful rug. The colors are nice and it is very soft. It is not thick but a rug pad fixes that right up. The thickness does not affect the expensive look of this rug. The short pile and what appears to be a tight weave of fibers makes this rug look and feel higher end than the price reflects. 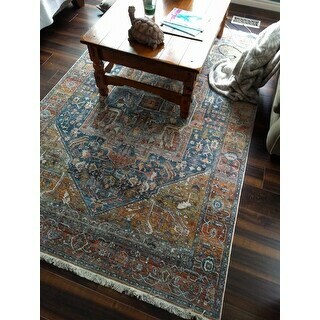 I will add a photo soon because other shopper's photos helped me make my decision (after a month of looking at different rugs). So beautiful and soft! Love this rug. 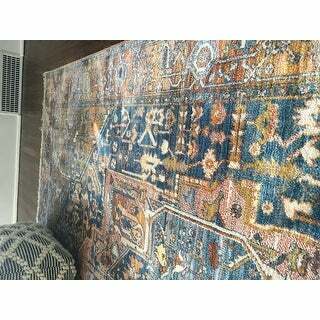 Option: Rust - 5' x 7' 9"
beautiful rug. not too much, but adds a pop of color. looks like the photo. 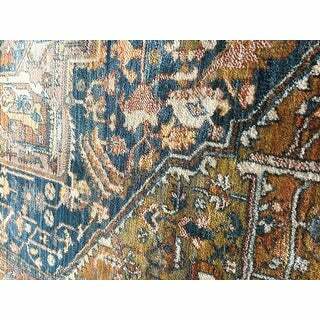 This is such a beautiful rug. The colors are very vibrant yet muted enough to fit any decor. The fringe on the ends make it look way more expensive than it was. It’s very soft also. Love it in my kitchen because if I spill something it’s not noticeable. Obsessed! This runner looks gorgeous in my hallways and is thin enough that the doors slide over it. Quality seems really nice and the pattern is even more beautiful in person. You do need a pad underneath to prevent sliding. I love it so much I am considering the bigger one for my living room! Excellent condition, very quick delivery. The style, color and size are a perfect fit for the space we are putting it in. It is also surprisingly soft and very comfortable. Couldn't be happier with this purchase! This rug is beautiful. The colors are a great mix of warm and cool tones and it's super soft. 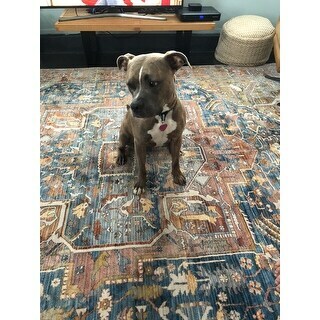 This is a good looking rug. Didn't have any smells. Doesn't shed. Feels soft. I've bought a non slip pad to go underneath and it worked great. The only thing I'd say wasn't as expected is the how it looks much lighter and washed out in a certain light. Must be due to the fact that it's synthetic and soft. Overall this rug is a keeper. Very soft and beautiful rug! Love the colors especially with my hardwood flooring. Love this rug! We used it in the nursery and get so many compliments on it. The colors are absolutely beautiful in person and aren’t as saturated as the image but I love it! This rug is gorgeous! I am still debating if I should buy a second one for another room in my house because we love it so much! When I unrolled it when I got it, it appeared lighter than what you see in the picture (I ordered the rust one). Depending on which way you “brush” it it appears to be lighter or darker like the pic. I believe this is due to it being rolled up so long but we are still in love with it! color not true to description online. Decent man-made fiber rug. Nice colors and pattern. Great for dogs as you can replace them when they start to smell. Would buy it again fr my family room. I ordered the 9x12 "Rust" colored rug, and my rug is much lighter (and cheaper) looking than the online photos. I spent a lot of time looking for the perfect rug, and was so disappointed when I opened this that I sent it back! It is soft though. The rug was cheap, paper thin disappointed in quality. I am happy with the thickness and quality of this rug but it doesn't appear to be the same colors as pictured. Also, when you brush the carpet fibers to one side it gives that white look.I love the fringes on the edges. 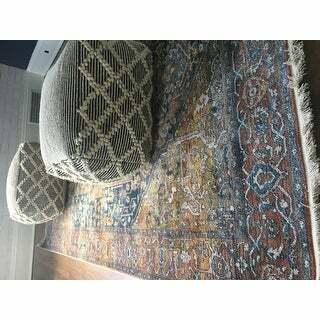 Overall, I am satisfied with the purchase and will keep the rug. "I'm looking for a runner for my kitchen. 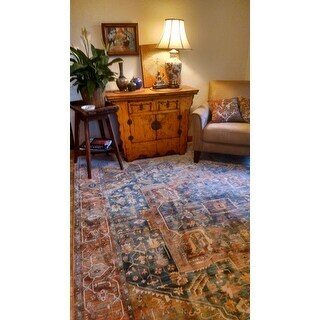 I like the Gracewood Hollow Lapointe Medallion Border Area Rug. I'm confused with the sizes of the runner. What does ' 6" X 8' Runner 2' 6" X 12' Runner mean.Can you send me exact measurements inches of length of the rug"
"What size is this rug? " This is actually available in multiple sizes. "Are colors bright are subtle, meaning is the orange hue more rust colored or bright? Can someone post a pic if possible?" "What is return policy? Do I have to pay for shipping? " The color combinations are beautiful! "Is the blue navy or teal?" Hand-hooked Bohemian Navy/ Multi Medallion Wool Rug - 7'9" x 9'9"